‘Purple Majesty’ is a long flowering excellent evergreen which is not too large but has that desirable purple colour flower. This plant was brought into Australia about 1995 by a Melbourne nurserywoman. It is a deliberate cross of guaranitica and gesneriiflora made at the Huntington Botanic Gardens. Since then there have been a lot of similar plants although usually much taller and bulkier. Purple Majesty doesn’t usually get over 1.5m but some others will be well over 2m – ‘Jean’s Purple Passion’ and ‘Violet Eyes’. The former is in Australia but hopefully not available (because it will get confused) and the latter is an Australian variety that circulates in Victoria. 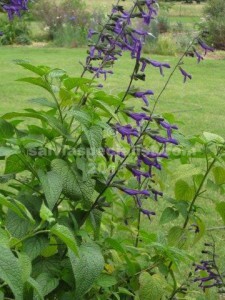 We have had ‘Black Knight’ since before 1980 which is similar to ‘Purple Majesty’ but over 2m or so. It looks to be a cross of guaranitica and van Houttii. There is also the Australian cross ‘Desley’ which leans more toward the burgundy colour of van Houttii. It is 2m or so. Now we have ‘Amistad’ (2013) which is closer to guaranitica but looks about the same flower colour to ‘Purple Majesty’. The plant is about twice as big being about 2m x 1.5m.